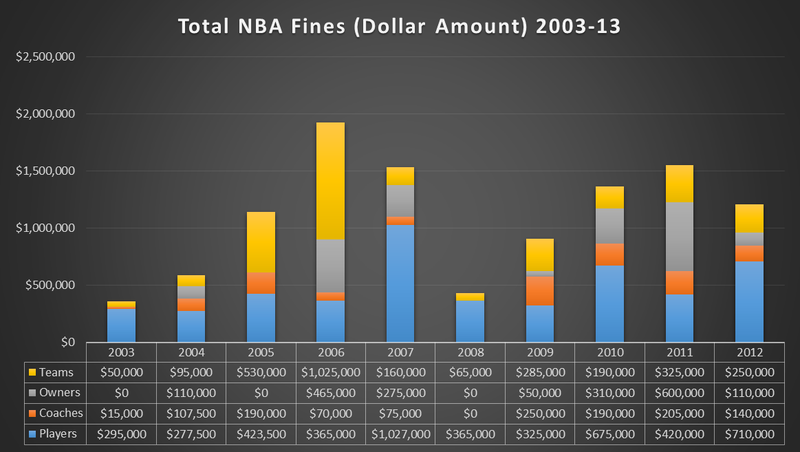 SeatCrunch has come up with a whole mess of ways to break down and chart all the fines handed out by the NBA over the last 10 seasons. It's fascinating. Not surprisingly, criticizing referees is the most common reason to be fined. "Fan confrontation" is the second-most. As far as individual punishments go, the most costly fines tend to be for fighting, social media faux pas, and the always-ominous "violating team policy." Player most often fined: Rasheed Wallace. Paid the most money: Vlad Radmonovic, who had to shell out $500,000 for a breach of contract after injuring himself snowboarding during the all-star break. Coach most often fined: Phil Jackson edges out Larry Brown. Owner most often fined: Mark Cuban, obviously, and no one else has more than two. Cuban shares the crown for the single costliest fine: He paid up $500,000 for saying he wouldn't hire league director of officials Ed Rush to manage a dairy queen. Heat owner Micky Arison also got slapped for $500,000 for an inappropriate tweet about CBA negotiations during the lockout. There are lots more graphics and info to be found.